HP Inc. split from Hewlett-Packard in 2016, and in the year and a half since, the company has focused on having the heart and spirit of a startup, but with the brains and muscle of a Fortune 500 company. To maintain its competitive position in a world rapidly being digitally transformed, CEO Dion Weisler used his keynote at HP Reinvent, the company’s global partner forum held in Chicago this year on Sept. 12, to explain how HP is preparing for three key disruptors of the future. Dion Weisler, CEO of HP Inc., speaking to the crowd at HP Reinvent in Chicago on Sept. 12. The most significantly disruptive trend, he says, will be rapid urbanization. United Nations data shows that in 2016, 42 per cent of the world’s population lived in urban centres, with this number set to grow moving forward. But as cities get bigger, spaces get smaller, and this has led to a shift from owning things to on-demand services, a growing sharing economy, as well as the blending of both physical spaces and work and personal lives. In recognizing these changes early, Weisler continues, companies can take advantage of the opportunity to shift to a more as-a-service business model. “Adopting flexible contractual sales models where everything is offered as-a-service to meet customer needs is a huge opportunity to optimize investments and obtain an ongoing revenue stream,” he advises. HP has followed its own counsel, moving to a managed service provider model for enterprise printing and announcing upgrades to its device-as-a-service offering. The second largest trend impacting the world is the changing composition of workers. Millennials and Generation Z (those born between the mid 1980’s and 1990’s, and those born after the mid 1990’s, respectively) will make up roughly half the workforce by 2020 according to Forbes, and they bring along with them a drastically different way of life than the previous Baby Boomer and X generations. Not only do they value staying connected at all times and flexible work styles, they believe doing good is the most important aspect of a job. They are also more willing to move for a good position, join a startup over an established company, and switch jobs every few years as opposed to staying with one company for their entire career. “Millennials and Gen Z don’t live separate lives; with how much they value staying connected, they live one single identity that combines both work and personal. And with their affinity for startups, we need to be able to support this workforce within a micro-employer landscape,” Weisler says. He also points out that millennials have contributed to the rise of the “gig economy” – essentially another term for freelancing or temporary work. Weisler tells IT World Canada that HP has seen these changes firsthand and values the insight younger workers bring to the table. It has added a millennial voice to its board of directors, in addition to the hundreds of young hires within the organization, and has flipped the traditional mentorship program on its head. The last disruptor Weisler highlights is the accelerated pace of innovation currently happening within the technology sector across the globe. 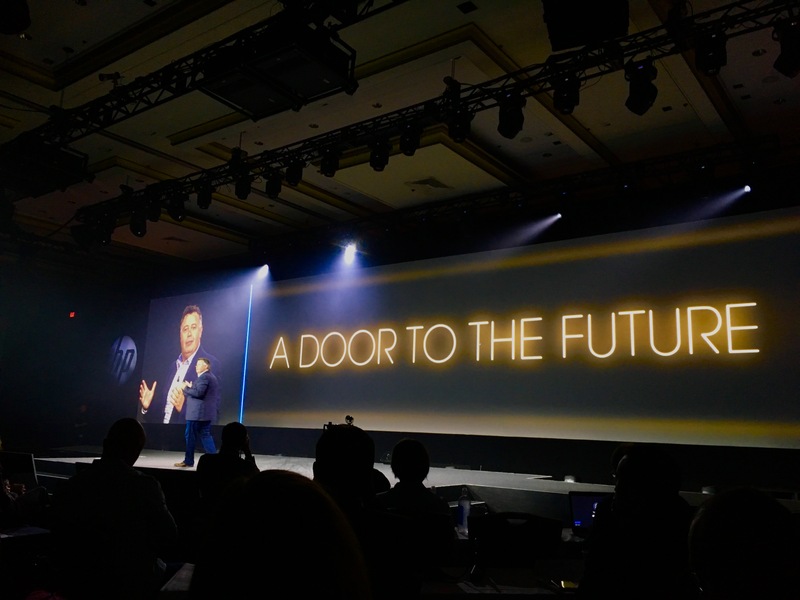 Technologies like artificial intelligence (AI), data analytics, the Internet of Things (IoT), and 3D printing will have significant impacts on every facet of life, and the HP CEO says he excited, if we can manage to secure it all. “We’re entering an era of ‘omni’ intelligence that’s driven by data and predictive analytics, and the pace of change is exponential. AI will improve nearly every aspect of our lives, analytics will help us unlock new business models, IoT means we will have constant real-time communication with all our devices, and 3D printing will make manufacturing easier. But with all of that comes all-out security warfare, and we need to be ready for that,” he adds. Weisler says it’s crucial for organizations to invest in security, especially for devices on the edge. Educating consumer through marketing campaigns, such as HP’s The Wolf video series with Christian Slater that highlights the importance of security for everyday connected office products like printers, is a good place to start. HP says it has the world’s most secure printers, and has spent much of its time developing products like SureStart, its automated self-healing procedure that reboots printers to their original state if compromised with malicious activity.